M. Manet, whose summary methods may appear brutal at times...seems concerned above all to express modern life exactly as it is and to free his art from technical conventions. Ernest Chesneau, "Le Salon sentimental. XII. 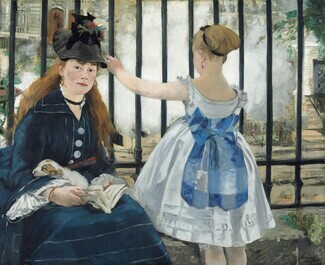 L’Art et la vie parisienne"
With her back to us, a young girl stands looking through a fence. Facing us directly, a woman sits with a small dog in her lap and a book in her hand. Billowing steam from an unseen train obscures the center background, but the edge of a bridge juts out at right, identifying the setting as Gare Saint-Lazare—Paris’ busiest train station and emblem of the city’s unsettling 19th-century makeover. Beyond depicting the modern city, The Railway disturbingly suggests how people experienced it. 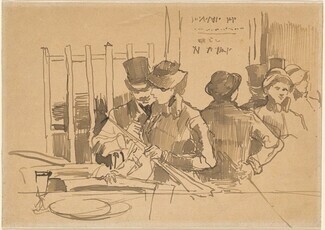 Pinned against a long black iron fence, these fashionably dressed female figures are physically cut off from the railroad beyond and also seem estranged from each other: facing in opposite directions, they are absorbed in their individual activities. Manet offers us no clues to their relationship, even as we viewers seem to interrupt the woman reading. She looks up at us directly with an expression that is neutral and guarded—the characteristic regard of one stranger encountering another in the modern metropolis. 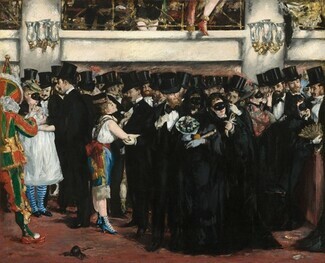 Most critics fumed at what they called Manet’s trivial and inscrutable subject matter (as well as his strident colors, loose brush work, and trademark flatly painted forms). 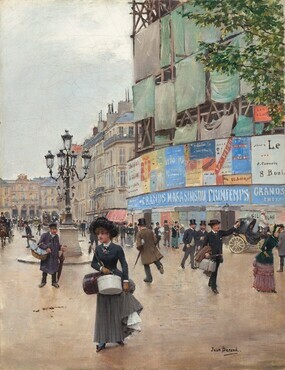 Few recognized that with its discomfiting mix of immediacy, psychological detachment, and indefinite narrative, The Railway represented the way Paris’ urban renewal program, of which railroads were a centerpiece, had destabilized social relations in the city. Henri Fantin-Latour, Édouard Manet, 1867. Art Institute of Chicago. Born in Paris to a wealthy family, Édouard Manet showed promise in drawing and caricature from an early age. After twice being denied admission to France’s prestigious Naval College, he enrolled in 1850 at the studio of academic artist Thomas Couture. 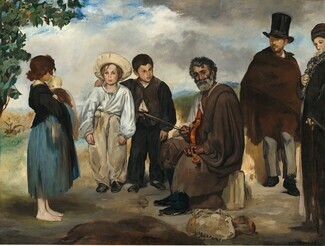 While copying paintings at the Louvre, Manet became attracted to the bold brushwork of Spanish painter Diego Velázquez. He soon adopted a free manner of painting that opposed the polished surfaces revered by academic artists. Rather than gradually building up a composition with layers of blended pigments and translucent glazes, Manet selected and applied patches of color side by side, from the start, for their final effect. Manet set out on his own artistic career in 1856. Soon after, his focus on modern subject matter—street scenes, bar life, and backhanded versions of famous art icons—coupled with his unconventional paint handling, regularly provoked critics’ wrath. Olympia, a painting of a naked courtesan who frankly engages the viewer in parody of the classic Venus, triggered an unparalleled scandal when it was exhibited at the 1865 Salon. The uproar made Manet the de facto leader of the avant-garde. Manet’s bold style, contemporary subject matter, and determination to challenge entrenched academic models influenced younger artists who would come to be known as the impressionists. Manet, too, learned from them, lightening his palette and using even freer brushwork. But he did not share the impressionists’ spontaneity; the striking immediacy of Manet’s greatest works resulted from a deliberate process involving drawing, models, and painting in a studio. Still determined to make his mark in the official Salon, he declined the more radical option of exhibiting with the impressionists. Manet continued producing enigmatic and inventive paintings about urban life until his death in 1883. While he had gained a reputation as an influential innovator, only posthumously would he be recognized as a father of modern art.